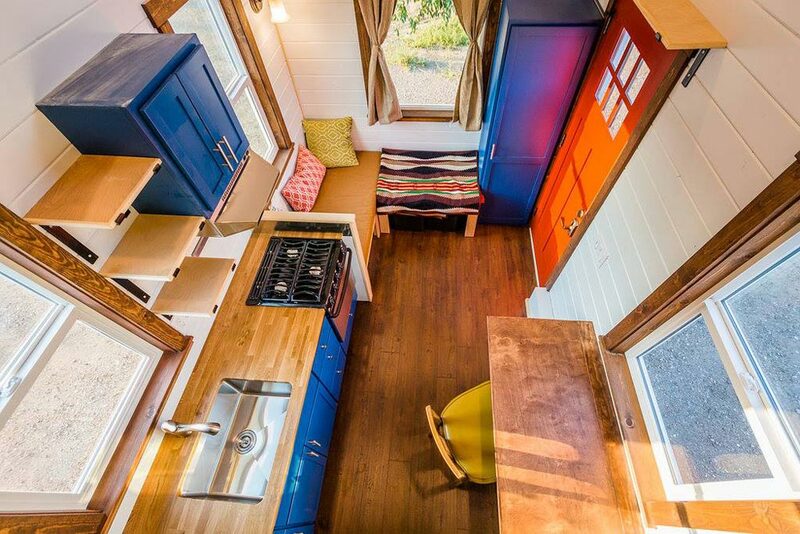 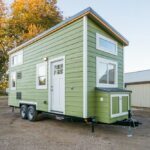 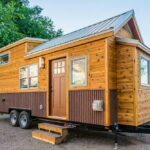 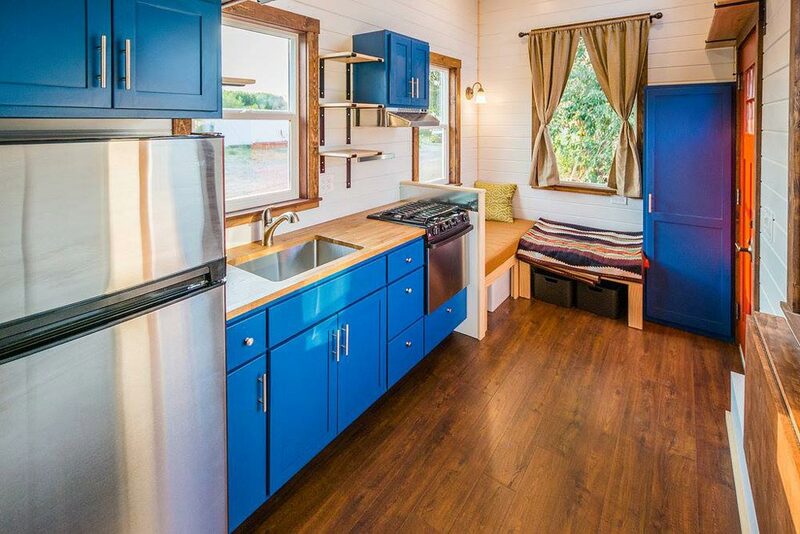 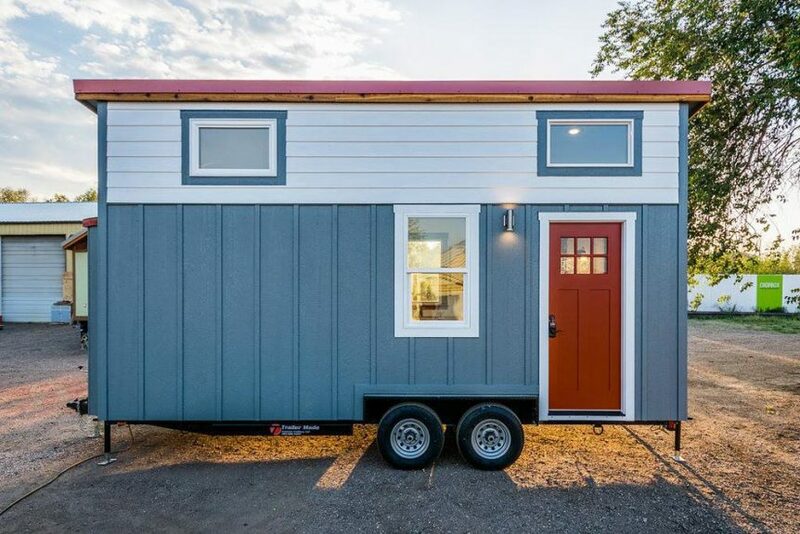 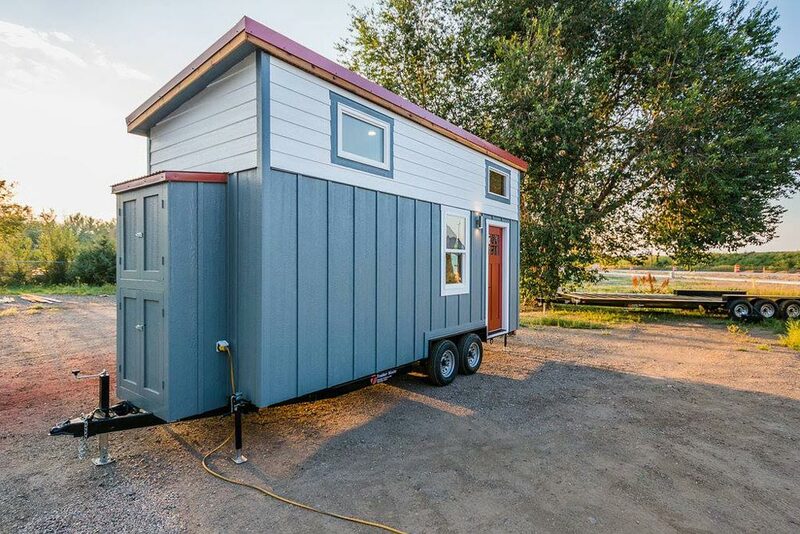 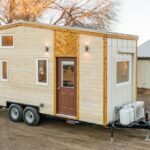 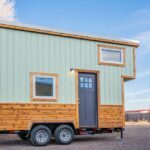 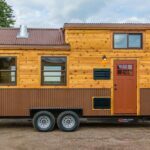 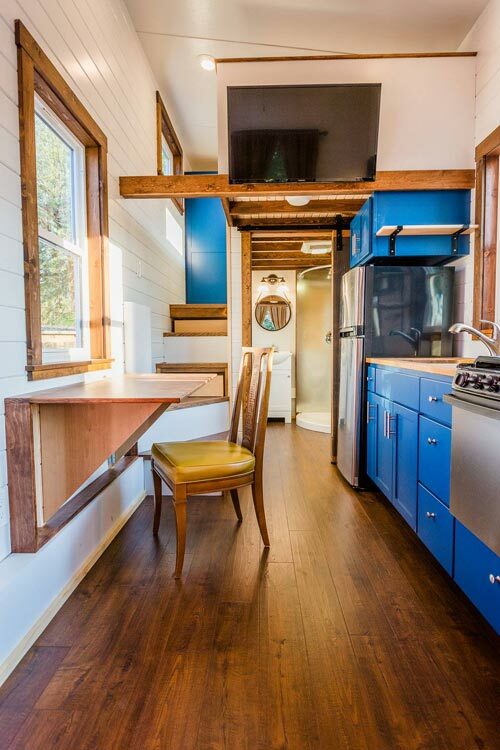 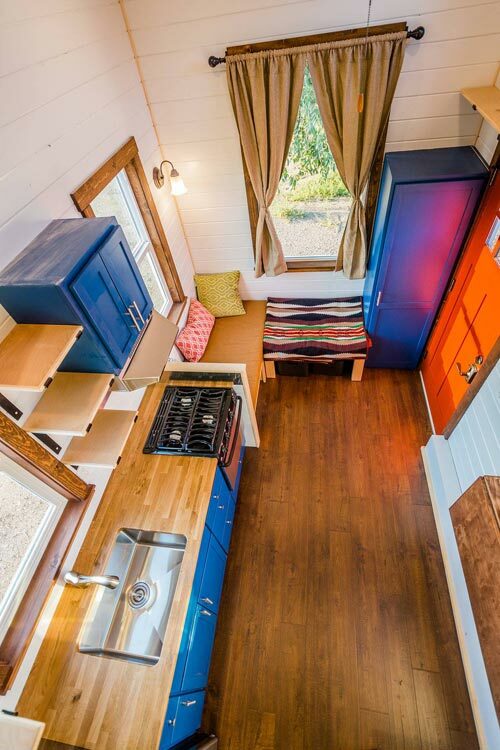 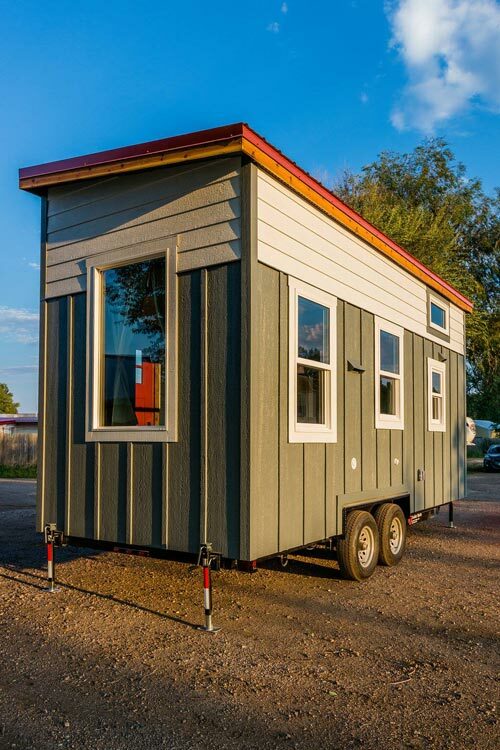 Built with a priority on storage space, this home by Mitchcraft Tiny Homes packs everything their client needs into a 20-foot tiny house on wheels. 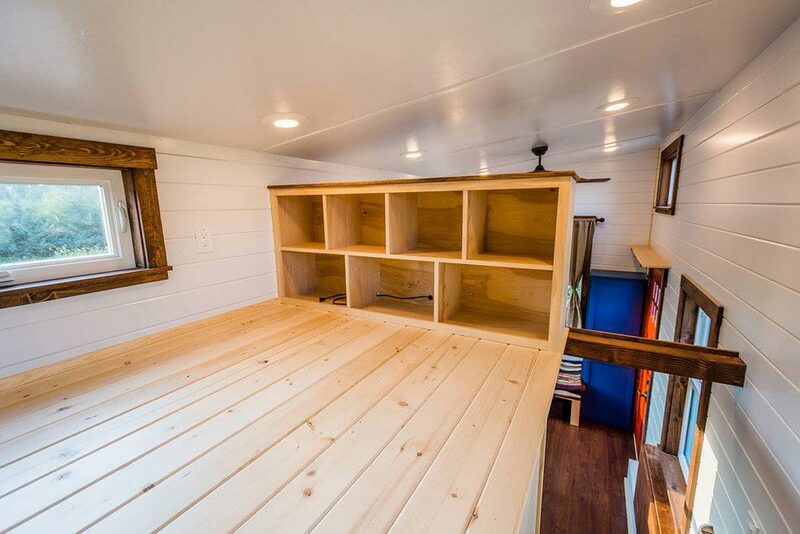 As you first enter the house you’ll find a built-in L-shaped living room couch, which converts into a guest bed. 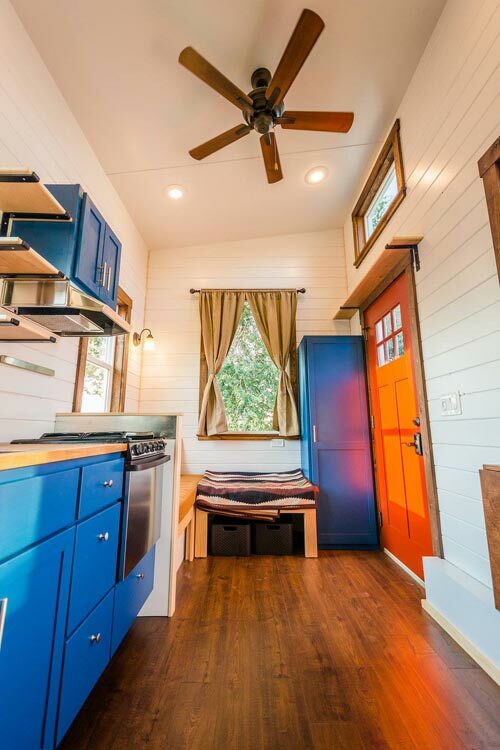 A large coat closet is behind the front door. 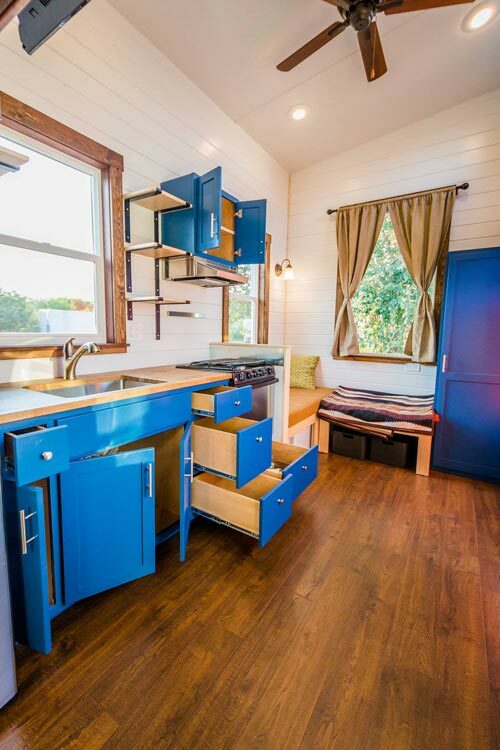 Bright blue cabinets and a red front door provide rich bursts of colors, while the white walls and ceiling create an open, spacious feel. 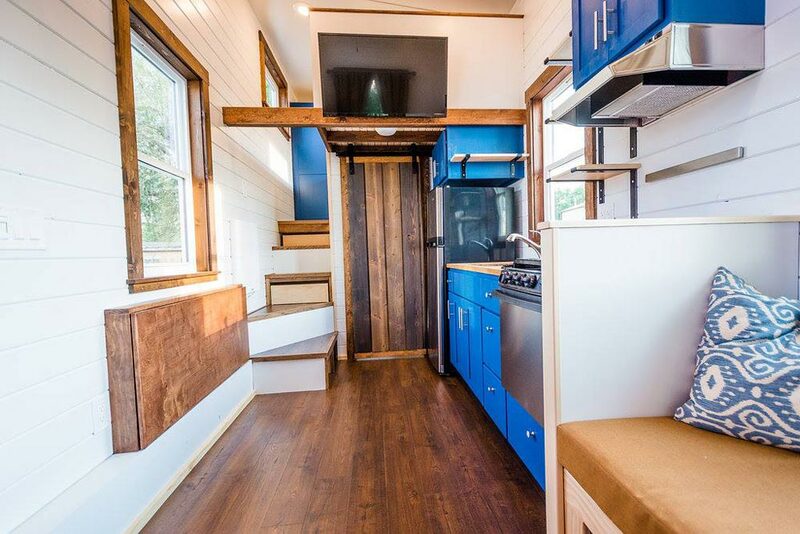 The kitchen has tons of cabinets and drawers, a three burner gas range with oven, a deep stainless steel sink, and a 10 cu.ft. 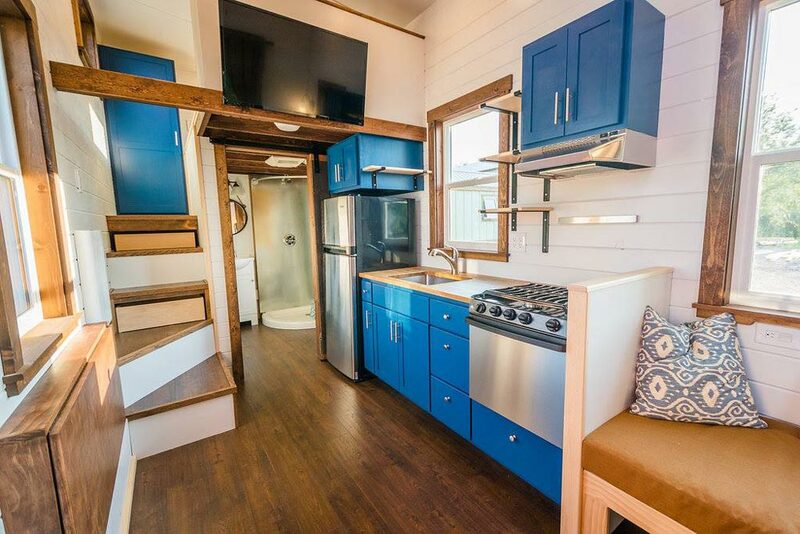 electric refrigerator. 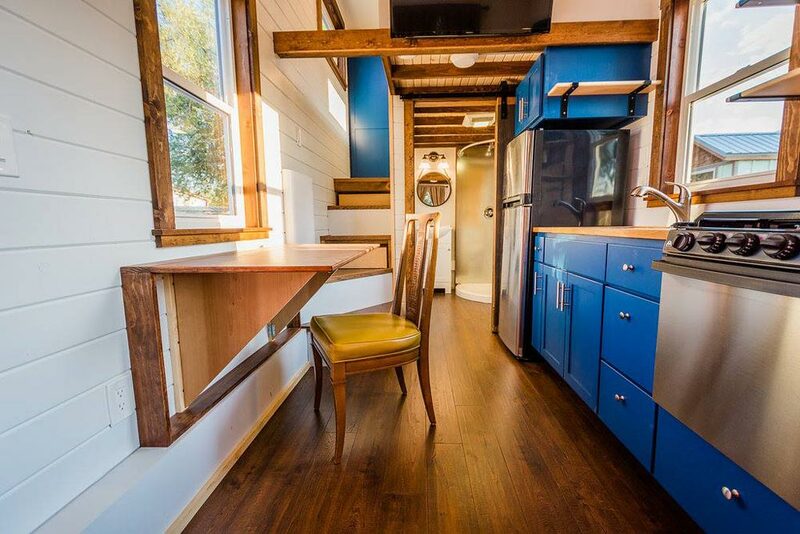 Across from the kitchen is a 48″ fold down table, which can be used as a dining table and additional kitchen counter space. 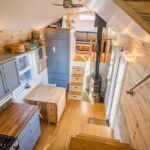 A short flight of stairs leads up to a landing platform that allows the owner to stand next to her bed. 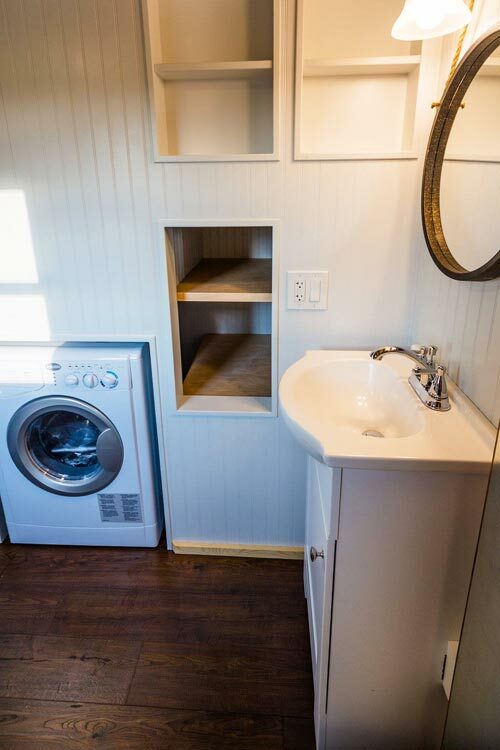 A full length closet and clothing cubbies provide plenty of clothes storage. 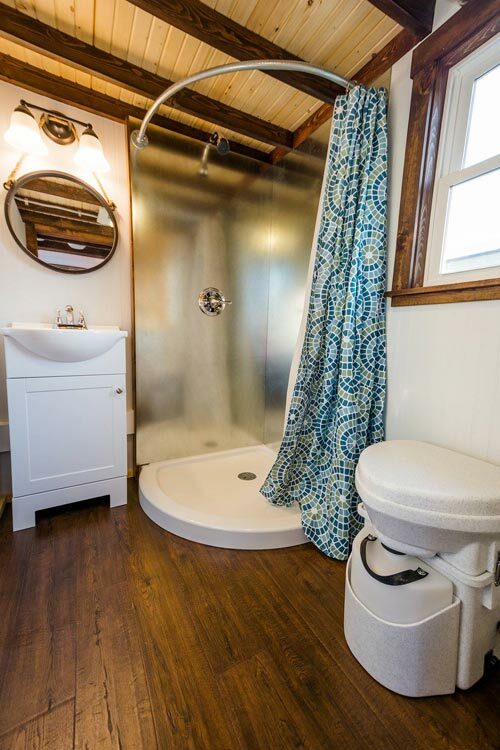 The large bathroom includes a washer/dryer combo under the stair landing, corner shower with stainless steel surround, vanity with storage, and composting toilet. 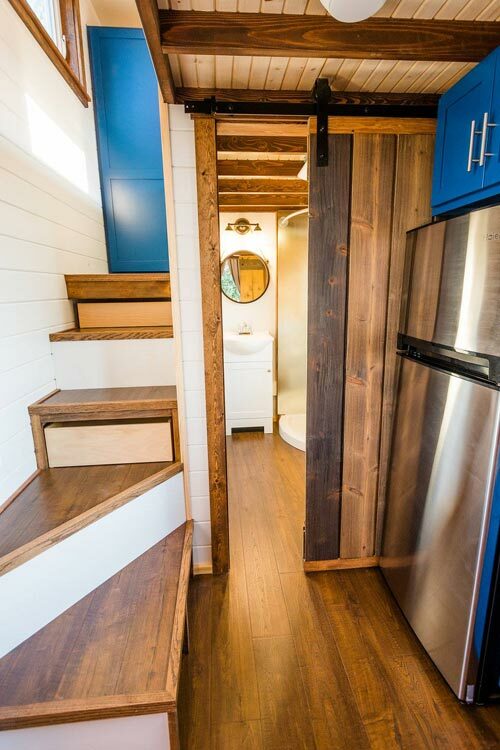 Additional storage is built into the stair landing as well.